Valdur Vesingi Released May 22, 2015! Valdur was paroled in May of 2015 after 14 years in prison in Tartu, Estonia. 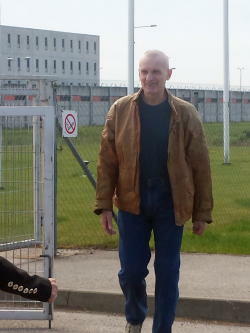 Robert Schultz of the Smiltene, Latvia Baptist Church, Monica (Valdur’s niece) plus Madli and Maria, Monica’s daughters, met Valdur Vesingi and Olavi Ilumets at the prison gate. From the prison, Valdur could only take those same clothes he was wearing when he entered prison. They had been in mothballs for 14 years. Unlike many of us, he could still wear them. The Church in Smiltene, out of their liberality, collected all the things necessary for Valdur to begin a new life on the outside, including all apartment furnishings, and all personal clothing and other items. Without this help, Valdur had nothing. 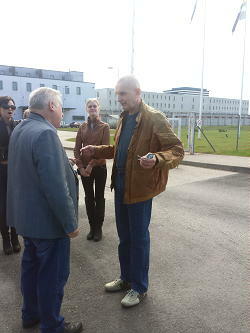 In Robert’s car, they followed Olavi to the prison house. Valdur only needed to live in that prison house one month before finding another accommodation. But, having that accommodation reserved was critical to his release. 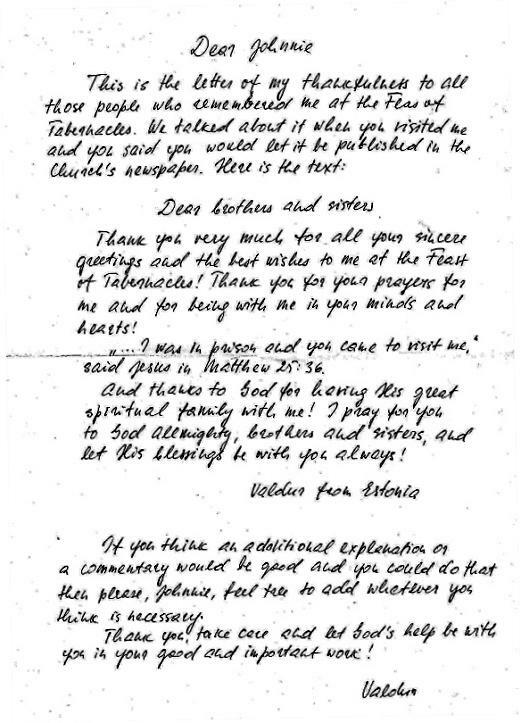 Special and eternal thanks to our senior pastor for the Baltics, Johnnie Lambert, who tirelessly pursued this case for Valdur's release. Below are photos taken on May 22, 2015 when he was released. We may have created a misimpression about Valdur's release. He is now able to make an application for early release. Applications will be considered by the court. There are two requirements necessary in order to make an application. It seems as if these two requirements are intended to be barriers to prevent prisoners from being released early. Just because we have met these two requirements, Valdur will not necessarily be released. It will be up to the court to decide. That court decision will still take a couple of months. He has been in prison for 12-13 years, and he has another 7 years to go. Completing these requirements is big progress, but there is still one very big hurdle to jump. Some of you know about this, several of you do not. 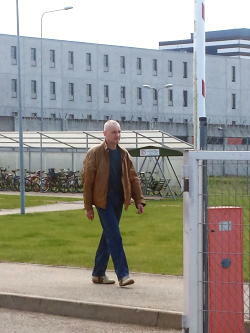 Valdur has been in prison for some 13 years as a result of crimes which he does not deny. I have been visiting him since around 2005. For years he insisted he never wanted to leave the prison because the prison was where he learned about God and there his life was changed. In the last year + he has changed his mind. He feels he can better serve God on the outside. He has been serving God and man on the inside by translating literature from English to Estonian. But in the prison, his time is limited to several hours per week on the computer. He wants to do much more. In the middle of 2013, we began to think about a request for early parole. In order to make an application, there are two requirements. Both seem rather difficult. 1. There must be pre-arranged a place to live. His niece, Monika Joost, stepped up and agreed to provide this in Elva, a little village about 12 miles from Tartu. Monika has a nice house as I visited her there on my last trip to Estonia in November. I also discussed clean and unclean foods with Monika and her two daughters Madli, age 22, and Maaria, age 17. The house is spacious enough to provide a private room for Valdur. 2. There must be pre-arranged a job. This is of course impossible for most prisoners. Very difficult for a convicted criminal to arrange a job from inside the prison. Again his niece, Monika, stepped forward. Monika advocated for him at the company where she works, Marepleks, also in Elva. This morning I went to Elva and met with the president, Tonu Aigro, of the company, Marepleks, to try to arrange for Valdur to be hired. God was clearly with us. Tonu and his assistant Pritt, have agreed to immediately provide a guarantee to the prison system that they will hire Valdur. I advised Tonu and Pritt that they could not expect Valdur to work on the Sabbath. During the visit, it became apparent I was meeting with men who have a strong conviction about God. Realizing that fact even unnerved me a bit in the middle of the visit. Some of you have been praying about this process, the rest of you needed to be informed. This is only the beginning as you must know. After the application is made, the Estonian authorities will decide on the request. Valdur has seen this many times. He relates that the application for early release is never granted upon the first request. So he thinks it will take at least two requests. Please pray for God's Will in this matter. Least we forget, please also pray God's blessings for Monika Joost and Tonu Aigro. One more day and we will find out what our God has in store .... one day more. Paul Dzing of Tucson, Arizona is a regular writer to Valdur. He sent me this update. forwarded to me. Johnnie states. . ."That Valdur was quite pleased with all the communication he had received during the Feast, as well as at other times. But was frustrated that he could not in his circumstances respond to everyone. I suggested that he write a letter to the United News, and so, he did and it may appears in print next time." So, I'm passing it along to you now - just to notify you with a sneak preview. . .
photographer. He has 14 more years to serve in prison. He speaks Estonian, Russian, and English, and some Latvian. He’s started to receive our literature three years ago and has had visits from our ministry (Johnnie Lambert and Victor Kubik) for over two years now. In process of time - he has translated three of our booklets into the Estonian language and is working on number four. He has translated Who is God?, What is Your Destiny?, Why Does God Allow Suffering? He dose not receive much correspondence, so he would appreciate all he could get. Corresponding with him would not be a problem, as he is very fluent in English.